The researchers hope their novel drug will safeguard patients from the hearing-damaging side effects of powerful antibiotics. 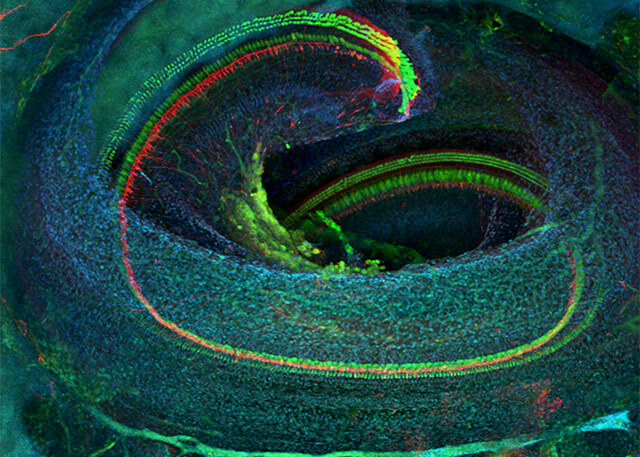 Confocal microscope image of the cochlea of a mature mouse. The receptor cells (green) spiral down the twisting cochlea. Nerve fibers are shown in red. Other elements are nuclei of supporting cells. The U.S. Food and Drug Administration has approved ORC-13661 as an investigational drug to protect people from the hearing-damaging side effects of aminoglycosides, a class of antibiotics used to combat serious infections. The FDA approval clears the way for a Phase I trial of volunteers to confirm whether the drug, which demonstrated significant protective ability in animal models, is safe for humans. From left, UW professors Rubel and Raible began collaborating on this research in 2001; Simon, of Fred Hutch, joined later. Their study of zebrafish was pivotal to understanding the mechanisms that affect hearing in humans. Fish have external hair cells akin to the receptor-cell structures in humans’ cochleas, which turn sound waves into electrical impulses for the brain to interpret. “With the hair cells on the outside of their bodies, we could observe them very readily for genetic and molecular studies,” Rubel said. Human receptor cells can be damaged as a secondary effect of antibiotics called aminoglycosides, which doctors employ against severe infections in cases of cystic fibrosis, immune suppression, and premature newborns, among other conditions. These powerul antibiotics – for example, gentamicin and streptomycin – can kill the receptor cells in the cochlea and balance organs, causing permanent hearing loss and unsteadiness for patients. Over 16 years, Rubel and Raible confirmed that the fishes' hair cells are similar genetically and in other ways to hearing receptor cells in humans and other mammals. In concert with Julian Simon, a medicinal chemist based at the Fred Hutchinson Cancer Research Center, and others, they tested the ability of more than 10,000 molecules to protect the zebrafishes’ hair cells from the toxic effects of these antibiotics. The researchers found that zebrafish hair cells have genetic and other similarities to human hearing receptor cells. Their breakthrough results, published last month, involved a change that amplified the effectiveness of a promising compound from earlier studies. The drug demonstrated outstanding safety and 100-percent protection of hair cells in zebrafish and rats in vivo. This spurred the FDA’s action. In 2013 Raible and Rubel co-founded a company, Oricula Therapeutics, which exclusively licenses patents for ORC-13661 held by the University of Washington and Fred Hutch. Oricula made the application to the FDA and will pursue funding for the Phase I trial of the drug's safety in humans, Rubel said. If that were to succeed, the next step would be testing the drug's effectiveness among patients who must take aminoglycosides to stave off life-threatening infections. Both scientists reflected on the infusion of $34,000 that got them going back in 2001. The money came from the UW’s Royalty Research Fund, a mechanism in which UW’s royalty and licensing fee income is selectively reinvested in promising new research.